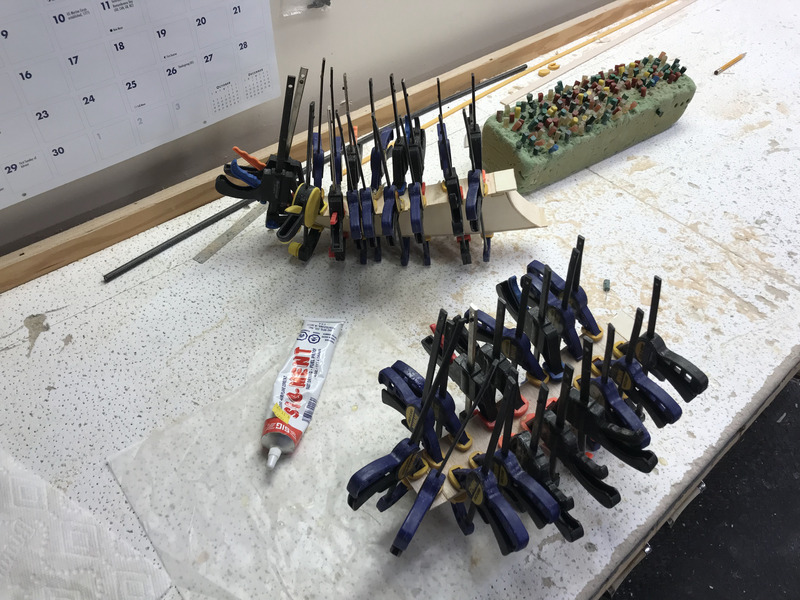 On April 20th finished off the floats and worked on sculpting the nose of the aircraft. In the case of the floats seen above I sanded the edges of the top sheeting I glued on previously. I sanded the edges of the sheeting to be flush with the sides of the float. To continue with the theme of sanding I did a lot of sanding on the block of wood I previously glued to the nose of the aircraft. 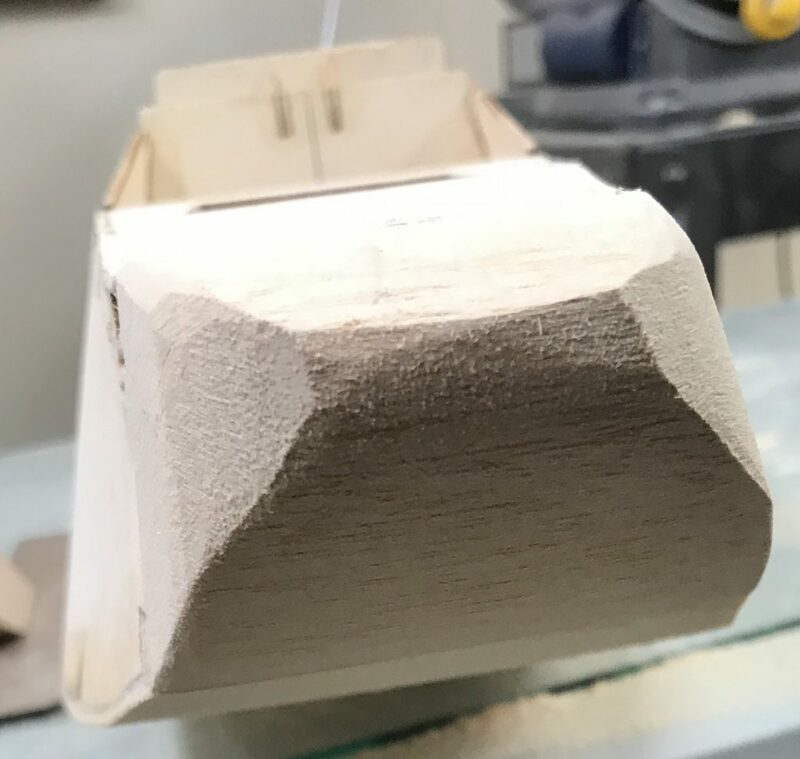 I marked some reference points on the wood, grabbed some sand paper and went at it for the evening getting my dose of cellulose that evening working. 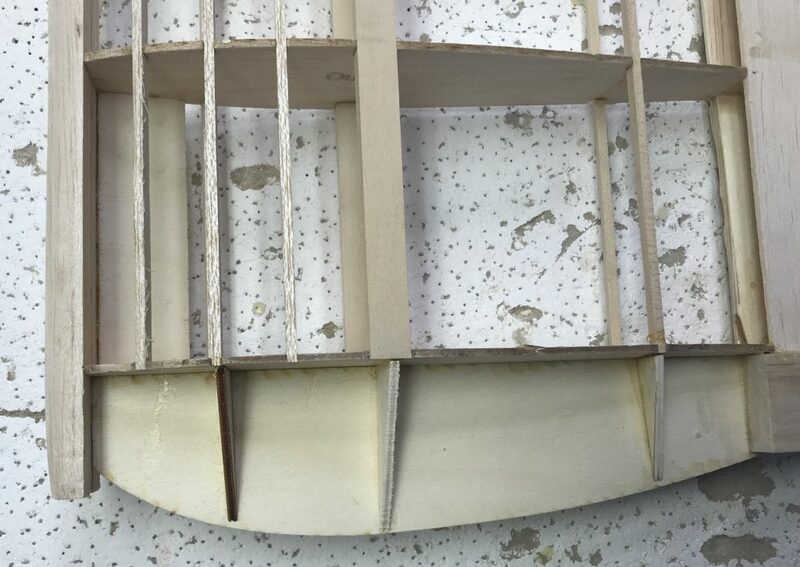 The goal was to follow the lines of the fuselage and sculpt the nose accordingly with an added dip near the end of the top of the nose, seen below, as well as a gradual incline up from the bottom of the nose seen in the picture at the bottom of this post. 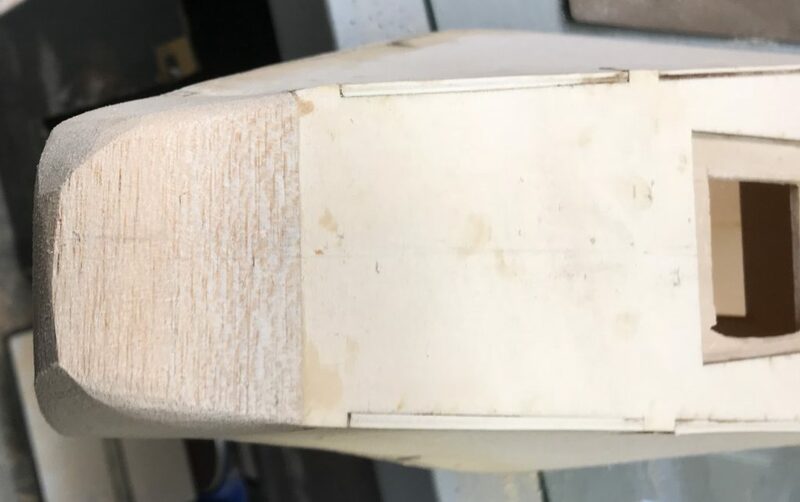 You can also tell there was more sanding done on the sides of the nose piece as well to give the final look seen in the pics below. On April 19th I completed the ‘wood’ version of the floats (still needs to be fiber glassed, etc.) and worked on the nose of the fuselage. 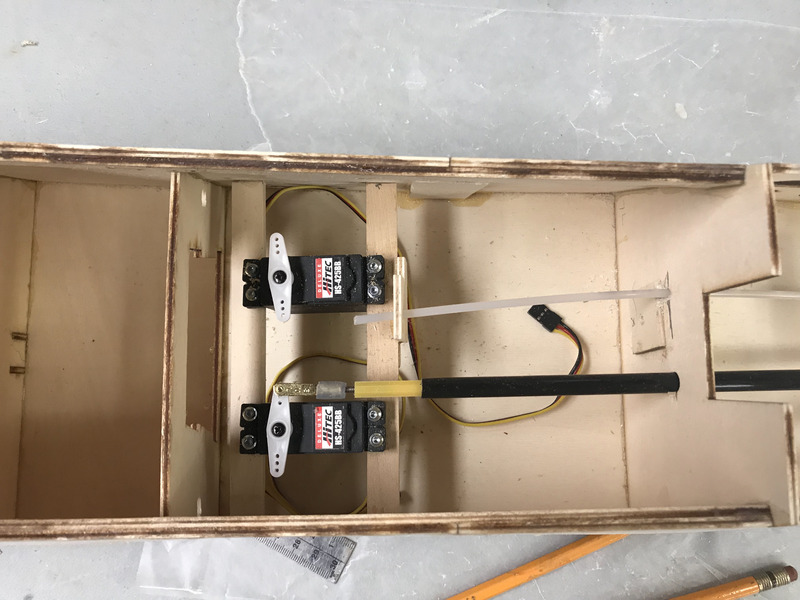 In order to do the floats I measured out a bunch of light balsa to glue to the top side of the float sides to make up the top of the floats. These were glued along the top edge as well as the front and back edges of top pieces where it made sense. 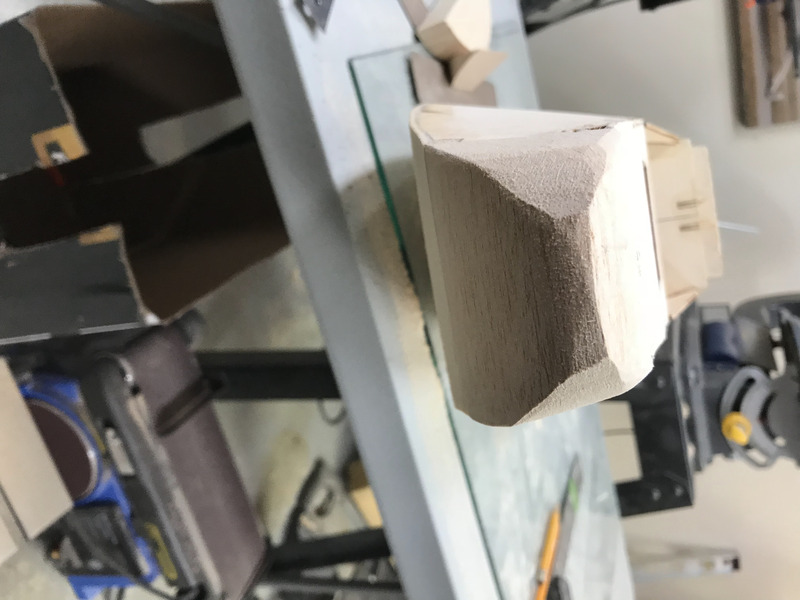 I also started sculpting the balsa block which will make the nose of the aircraft. 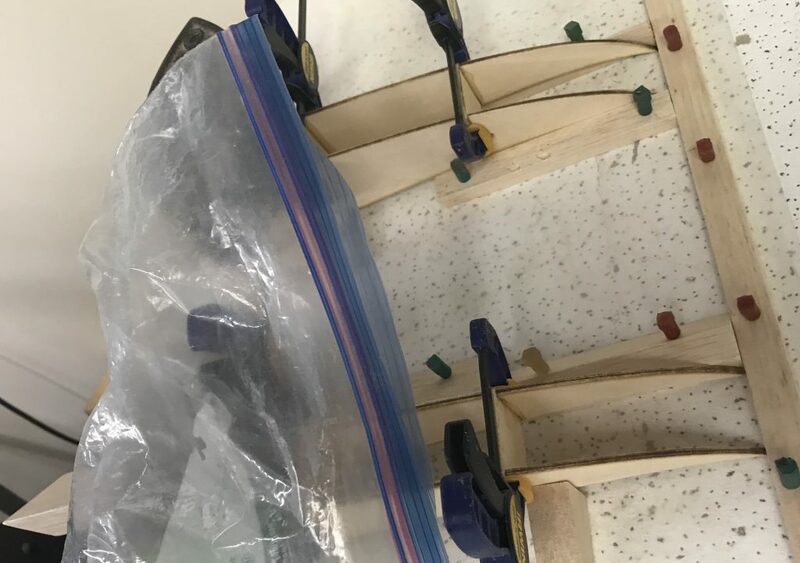 On April 18th I worked on the floats and got a hard piece of wood glued to the back of the floats which will be used for screwing to the bottom of the wing, holding the back in place. There will also be a screw going through the front of the float as well. As seen in the top pic I glued the nose to the front of the aircraft. It is nowhere near done yet. 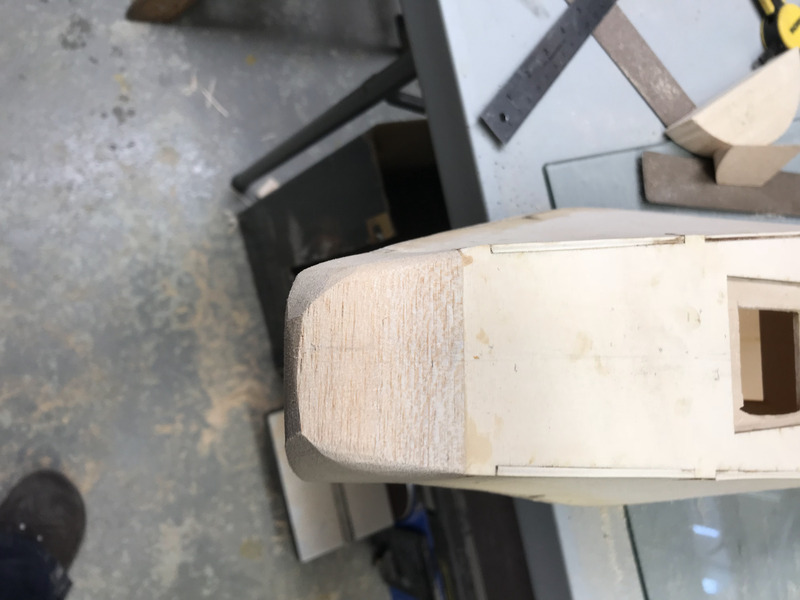 This started with a square piece of wood that I templated and then cut down to size as best I could using a table jigsaw and perhaps even some sanding at this point with the knowledge that I lot more sanding was on the horizon! 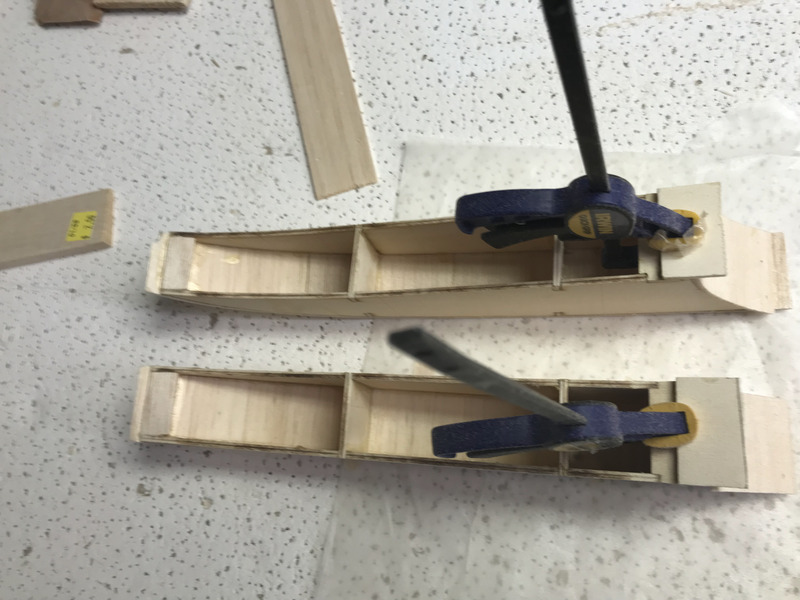 The piece was then glued to the flat nose of the fuselage and clamped into place while it dries for next time. 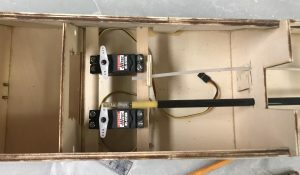 John mentioned something yesterday in that his needed a lot of counter weight and that it would be good to hollow out the nose so that weights could be attached in there. To late for that now, so will be interesting to see what happens when it comes time to do the final balance of the aircraft. 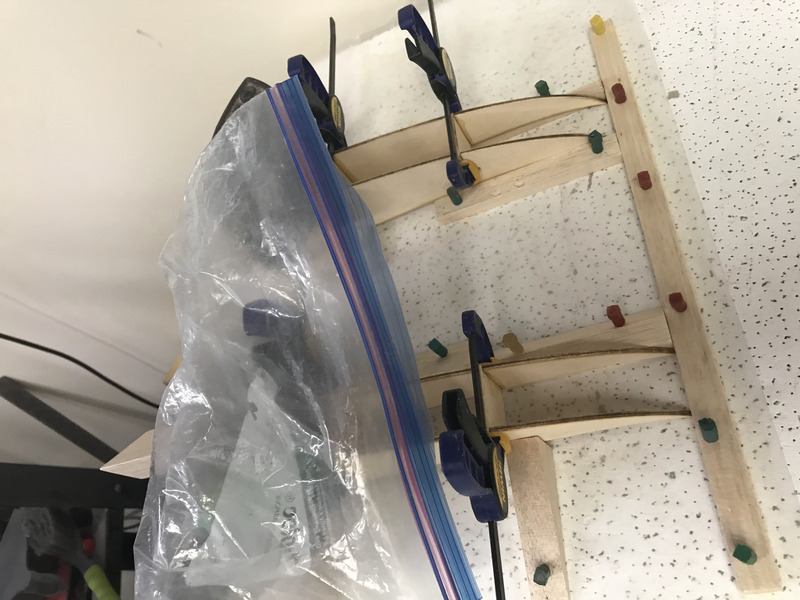 On April 14th I did a fair bit of work on the wing and a little bit on the fuselage. On the wing the supports were glued into place. 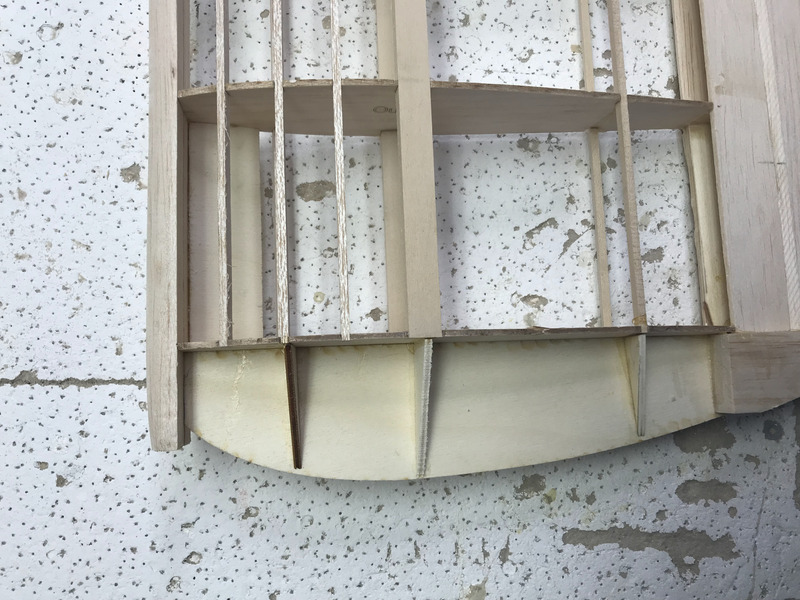 This is top and bottom for both wing tips and provides stability for the wing tip to prevent over flexing, etc. You can tell in looking at the leading edge of the picture below followed by the leading edge in the featured image at the top that I rounded the leading edge to get the aerodynamics going. This involved a lot of sanding. 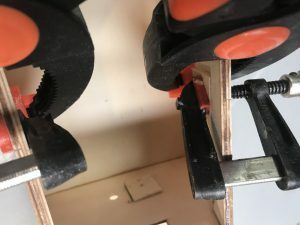 Key here is to wrap the sand paper around the edge and work it back and forth pulling down and away from the edge back and forth to get the rounded effect desired. This day I also glued the bottom, light balsa, of the floats to the sides. 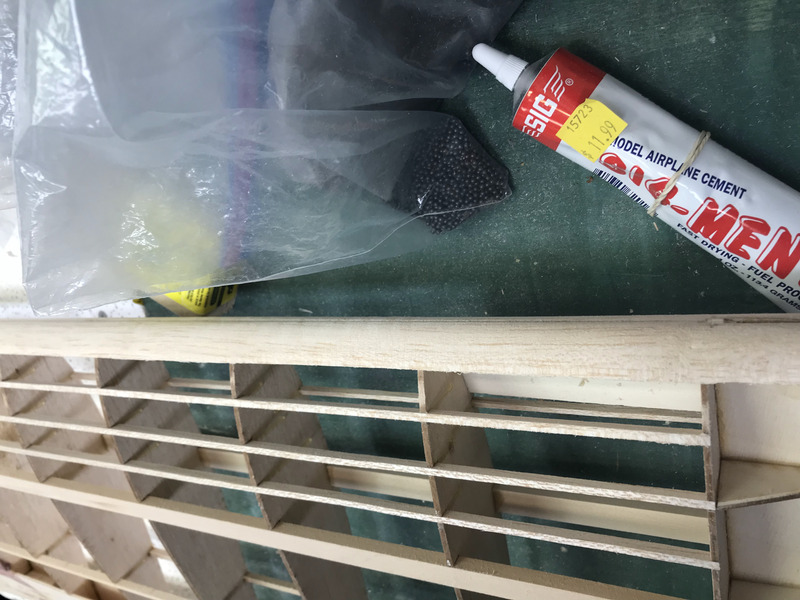 Eventually the floats will be fiber glassed and special paint applied to make them water proof as these will be placed out on the wings for flotation in the water. 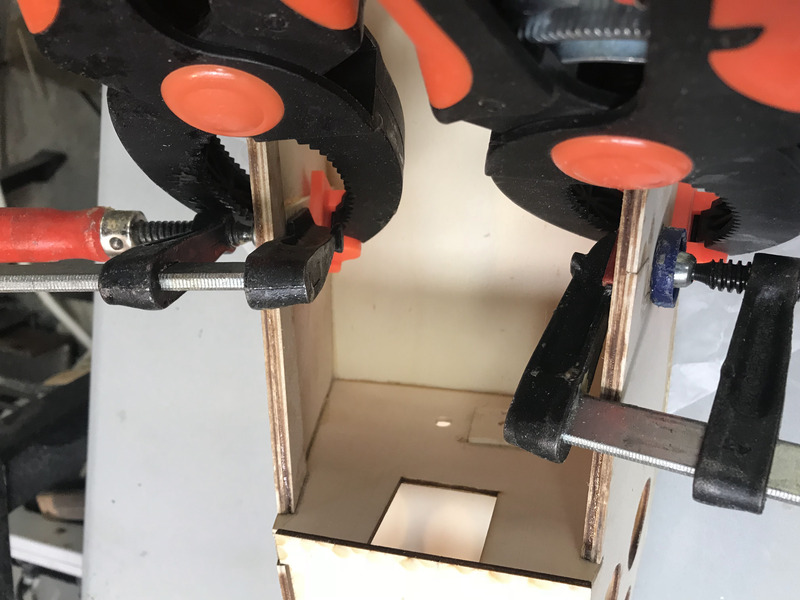 Making sure the push rods are long enough (and casing cut back to allow movement of the inner rod) for the rudder and elevator of the aircraft to where the servos are mounted. 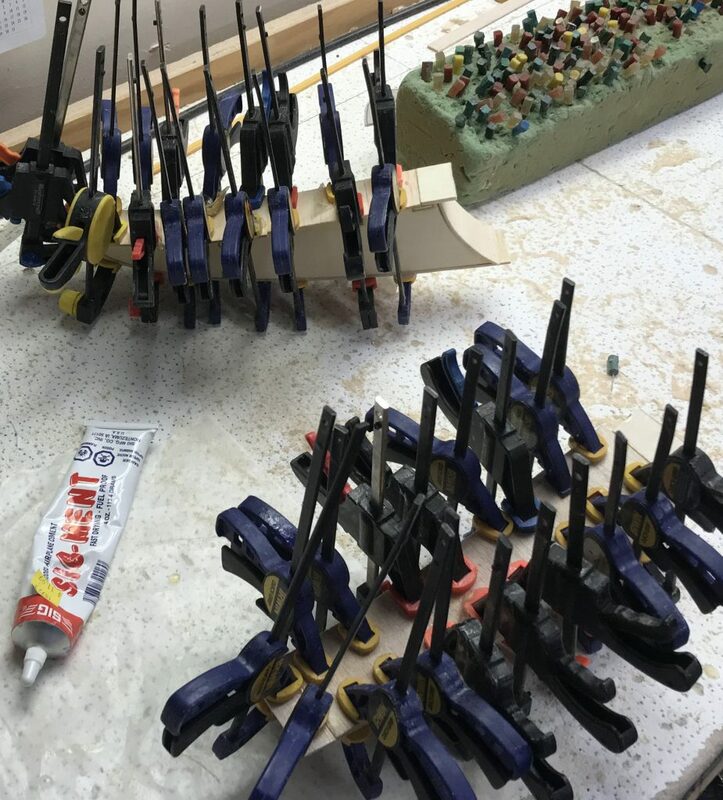 On April 7th I worked on the floats… sanding of them already took place and so I verified and then glued the sides to the support pieces. 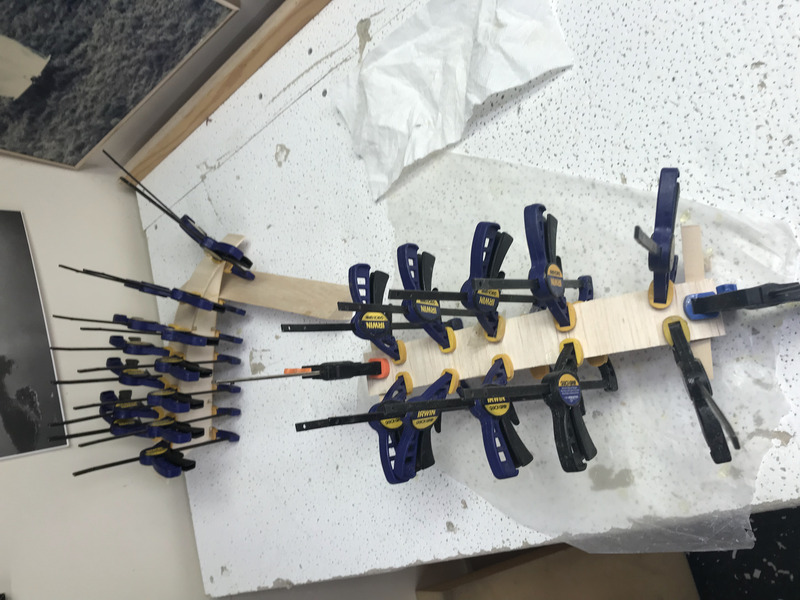 You can see the system rigged up below to keep pieces in place along with clamps on the glue joints while the glue dried. 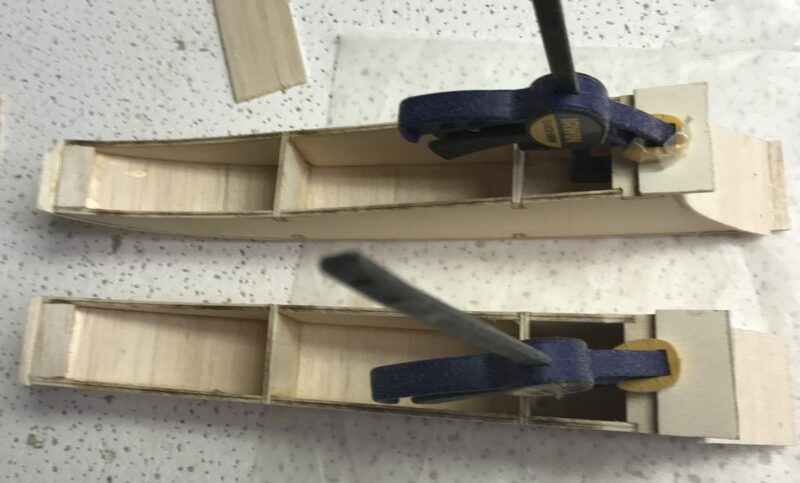 The other thing I did this day was glue pieces of wood the width of the teeth joint (connecting the two pieces of the sides of the fuselage together) to the inside of the fuselage to cover the seam and provide reinforcements for the joint. This can be seen below.